Without an identity card, women cannot access services. They cannot report sexual harassment, go to the police, or even go to hospital. If they try, the services don’t take any action, they take them away them to migrant offices first. Whilst Turkey has adapted international law into national law to offer some protection, there are major implementation gaps. Activists struggle with discrimination, racism and patriarchal values which mean that state agencies fail to fulfil their duty to protect against and investigate cases of violence. The Ministry of Family and Social Policies requires that shelters only work with women where the violence has taken place within Turkey. However, many women leave their countries due to violence, and are in need of accommodation when they arrive. 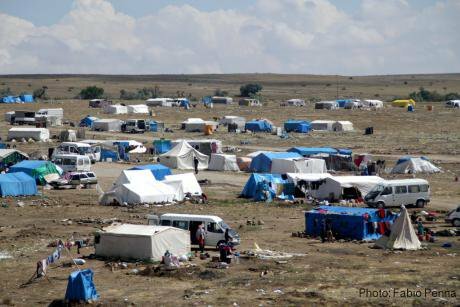 They currently cannot access shelters, most of which in Turkey are run by the state. For the migrant women who are accepted, they can face discrimination and racism from other women (Turkish nationals) living in shelters, and their children are shunned. Women talk about shelter staff ignoring the abuse and choosing not to intervene. Many shelter staff, police officers, and other officials are not trained in migration law, resulting in violations of the human rights of migrant women. Turkey is a party to the İstanbul Convention, but has failed to fulfil a number of its requirements, including training for professionals to ensure women’s right to protection from violence is realised. For example, in all legal procedures there should be access to interpreters, but the absence of them, especially in police stations and women’s shelters, limits access to justice. NGOs try to fill the gaps, but this is a state responsibility. Only one in 5 women are in paid employment in Turkey. Combined with this, language issues and gender based discrimination means that few women refugees can find paid work other than low paid cleaning or child care outside the formal economy, increasing their dependency on men. Women who migrate with their children face further barriers, as they cannot combine child care and employment: this is one of the contexts in which ‘early marriage’ of girls becomes a survival strategy. Marriages under the age of 18 are not recognised in Turkey, they are common among Syrian migrants for young women. Viewing this as a ‘cultural difference’ means that there is limited if any protective intervention. The experiences of NGOs indicate that the authorities ignore official complaints and are not willing to do legal sanctions. Some ‘early marriages’ could be understood as a form human trafficking: in the border provinces, young women are persuaded to come to Turkey with promises of a better life only to find they are forced to either marry a Turkish or Syrian man (possibly as a second or third wife), or forced into prostitution. Feminist NGOs in Turkey have undertaken studies and support work with women migrants, but the scale of the problems are so large that this is only a sticking plaster. It is for this reason that they are calling on the Turkish authorities to ensure that women migrants are afforded their rights under the Istanbul Convention: the European convention on Violence Against Women that was finalised in Turkey in 2011.